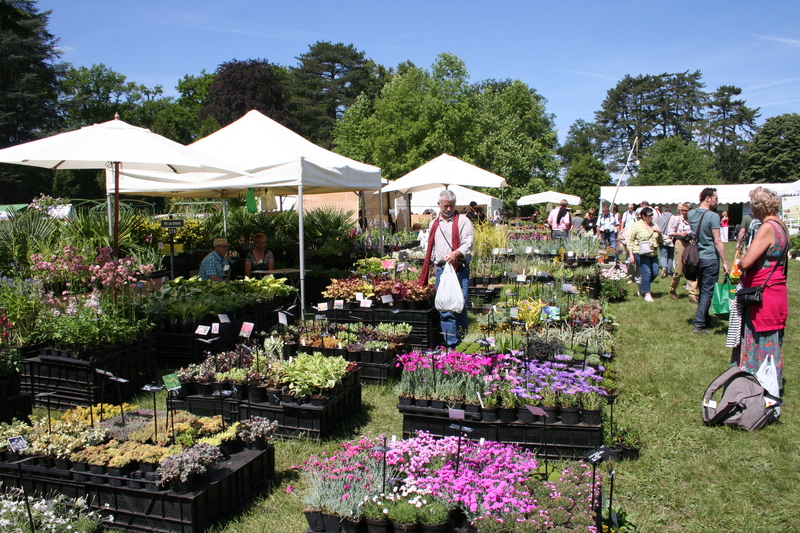 On Friday we took up our invitation to the spring plant fair at the Domaine de Courson, surely Europe’s and perhaps the world’s greatest plant fair. It is held twice a year in the grounds of the chateau, south of Paris. When working in the UK we were unable to justify the time for both Courson and Chelsea and only visited for the autumn fair. These days we live just two hours from the Domaine and are delighted to make the pilgrimage in the spring as well. We are already looking forward to October 14th, our next opportunity to indulge our passion for plants. There are three problems with Courson, where many of Europe’s best nurserymen show their wares: firstly we do not have a large enough garden to accommodate all the plants we would like to own; secondly, we could not afford to buy them all. Still, at each show we spend beyond our allocation, selecting our favourites, changing our minds and agonizing over which plants to leave for another trip. More than once over the years, I have stopped in the middle of the show after several hours of plant hunting, physically and emotionally drained by the experience. The trick is to remember to eat at lunchtime and to drink plenty of water: Courson is hard work! The third issue is that with so much wonderful plant material on display it is inevitable, even after five hours or more of hunting, you have missed much more than you have seen and not given nearly enough attention to so many fine stands. I have never found the time for one of the many lectures and conferences they organise over the three days, a pity given the quality of speaker they are able to attract. I am beginning to think that a two-day visit is called for and we have already selected a B&B required for the night. “What did we buy?” I hear you say. The plant of the show as far as we were concerned, was Cornus Venus. Those of you who do not know the Flowering Dogwoods are missing something very special and this new variety, a cross between Asiatic Cornus kousa chinensis and American Cornus nuttallii is amazing. 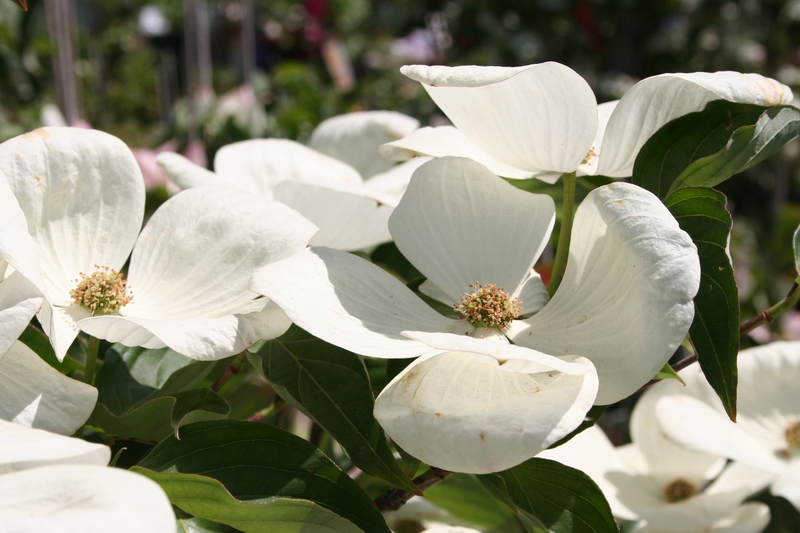 The “flowers” of these Cornus are actually bracts, modified leaves which look like petals, creamy white, 10cm or more across and produced in quantities which almost smother the plant. It was bred by Dr. Elwin Orton of Rutgers University New Jersey, who was responsible for a breeding and excellent range of new hollies, also mixing Asiatic and American genes. This Cornus will now grace a prime position against the log cabin classroom where it should grow to a plant of around 4m high and broad. It is said to have spectacular autumn leaf colour in addition to red fruits and we are very excited to have such a plant in the garden. Equally exciting was a purchase we have been putting off for many years, lacking a suitable place to grow it: a yellow flowering Magnolia. 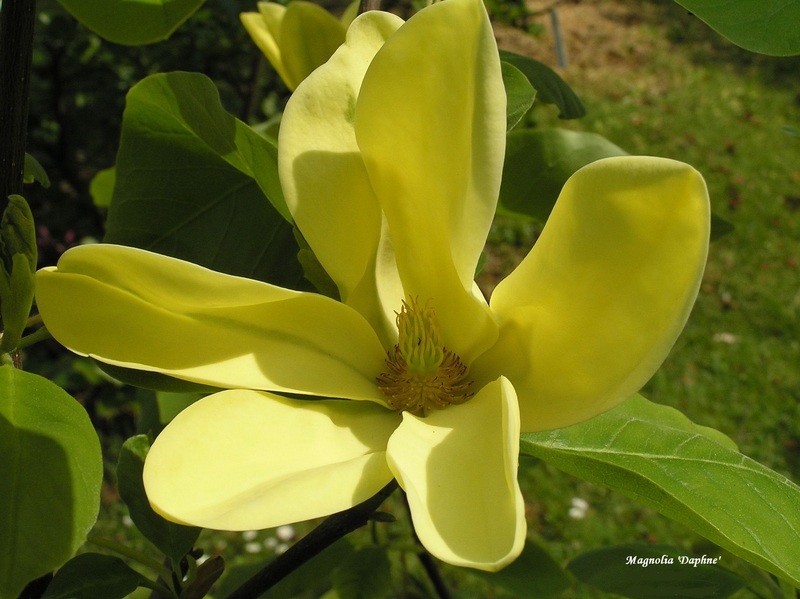 Having waited patiently many new varieties have appeared and Pepinieres Botanica, who show a huge selection of Magnolias and other choice trees and shrubs, were offering several. We took advice and eventually selected Daphne, one of the best of these, bred in 2000 by Philippe de Spoelbergh. The parents are said to be M. acuminata ssp. subcordata ‘Miss Honeybee’ x M. ‘Gold Crown’. It has now been planted in a new bed we are creating close to the old washing basin and pump on the east side of the garden. We have a problem with the front wall of the section of the building that we rent out as a holiday apartment. It is a large wall, facing north and the little garden surrounding lacks colour on that side. Our answer was a plant of Schizophragma hydrangeoides ‘Rose Sensation’ a new variety looking similar to the common climbing Hydrangea, but with more attractive shoots and pink flowers in the summer. This came from Les Hortensias du Haut bois, a specialist who grows a staggering 750 varieties of Hydrangea. The apartment itself we call Rose Cottage and at the moment a huge Rosa Paul’s Himalayan Musk is in flower on the fence and the wall. We thought we would add a bush rose of the modern/ old fashioned type for which David Austin is justly famous. We were underwhelmed by his stand however, and selected a specimen from a French grower instead. The beautiful pink, scented flowers of Elodie Gossuin are a winner and the plant will grace the apartment garden as soon as I dig a little bed to accommodate it. The variety is one of the Rosa Generosa series from Guillot, who have been rose growers for more than 180 years and specialise in old varieties. We were looking for plants for the hot, dry and sunny bank in the front garden but failed to find interesting Lavenders or, my wife’s favourite, x Halimiocistus, the cross between a Cistus parent and a Halimium. In the past we grew Merrist Wood Cream, a hybrid of Cistus salviifolius and Halimium lasianthum ‘Formosum’ and were hoping for a replacement; we did buy a couple of Helianthemums, Fire Dragon and Supreme, which we have planted either side of a self-seeded Lizard Orchid. Also on this bank sits Echium russicum, a red flowered version of the Viper’s Bugloss native to the Steppes. I gather it is short-lived so I hope it will self-seed in what I trust is an ideal site. We saw plenty of other wonderful plants, including Alstroemaria and Hippeastrum on the Pierre Turc stand, but eventually had to leave while we still had the energy; the day was exhausting, with 5 hours spent at the show and four hours of driving, but we came back content, richer in many ways, if a little poorer financially. This entry was posted in france, garden design, Garden Design Academy, gardening, gardening shows, plants and tagged Chelsea Flower Show, Cornus Venus, Courson, Echium russicum, Elodie Gossuin, Helianthemum, Rosa Generosa, Rosa Paul's Himalayan Musk, Schizophragma hydrangeoides 'Rose Sensation', x Halimiocistus, yellow flowering Magnolia Daphne by ukhostland. Bookmark the permalink. They really show what can be grown in a dry climate and they also have a nursery and sell plants and I remember seeing some very interesting Hydrangeas for sale. Up until now in the UK its been the plain boring pink or blue hydrangeas but we are just beginning to see some of these interesting varieities. Enjoy the flower show – it looks fabulous ! Think we saw a stunning large cornus something or other at the Lost Gardens of Heligan this year.